Norwegian black metal music star Sigurd “Satyr” Wongraven spent another Easter taking part in the annual Inferno Festival in Oslo, which attracts black metal fans from all over the world. This year, though, he could promote his wine along with his music. It may seem somewhat out of character for a heavily tattooed and made-up black metal star to appreciate the virtues of a fine red wine, but that’s what Wongraven has been doing ever since he met grape grower Luca Roagna during a concert tour in Italy in 2003. Wongraven and Roagna, a fifth-generation winemaker in Piedmont, clearly got along well and Wongraven ended taking a sabbatical from his band Satyricon, during which made wine with Roagna. 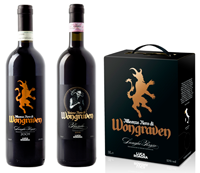 The result is the Wongraven Alleanza Langhe Rosso and the Wongraven Unione Barolo, both of which feature labels bearing gothic lettering and drawings that tie the red wine to black metal. Wongraven told Oslo newspaper Aften last fall that Roagna’s job was out in the vineyards and in the cellars, while he did the blending. Wongraven’s passion for wine and winemaking, and the creation of his own wines with Roagna, prompted the Inferno Festival to invite to a wine tasting on Good Friday, making for an unusual interlude during the festival’s four days of black metal performances. The tasting sold out quickly, but the Wongraven wines were available for sale throughout the festival.